Zone E in the MLHs includes Iberian inscriptions that come mainly from Zaragoza and Teruel, although the most westerly sites in these two provinces belong to Celtiberia (zone K). 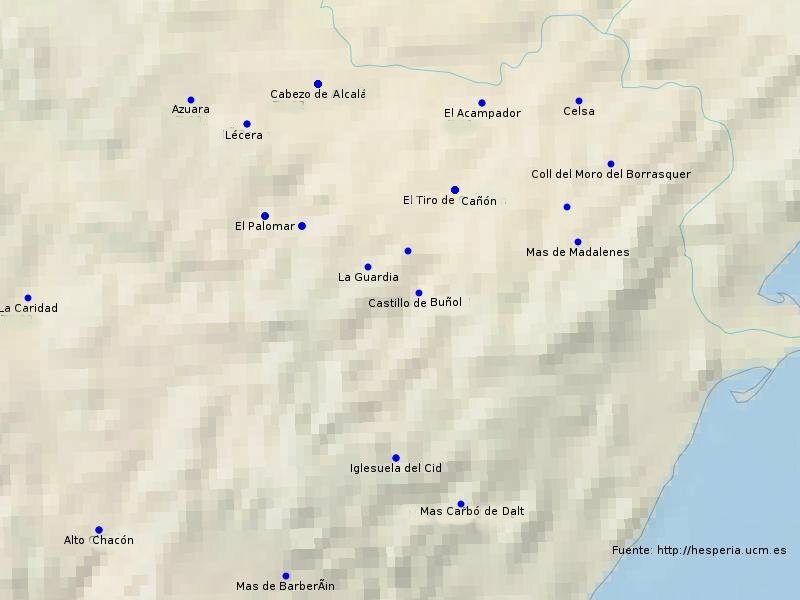 Nevertheless, Iberian inscriptions have also been recovered in some Celtiberian cities, such as in Caminreal (TE.04.03-04) and Botorrita (Z.09.06-07). Two bordering localities in Tarragona are added. Non-Celtiberian inscriptions in Navarre have also been included, which Untermann published in vol. IV of his MLHs, such as those from Andelo (NA.03) and Aranguren (NA.05). In total, there are 27 known localities: 2 in Tarragona, 15 in Teruel, 7 in Zaragoza and 3 in Navarre. The region was occupied by the people of the Sedetani, who should be differentiated from the Edetani, despite the fact that Ptolemy (II 62) catalogues the cities of both together / in the same section equally (Fatás 1973; Burillo 1996a). The following are considered Sedetanian localities: Damania, Leonica, Osicerda and perhaps Arsi and Etobesa too. These people are also attributed with the mints of alaun (Mon.16), iltukoite (Mon.20), kelse (Mon.21), lakine (Mon.22), otobeśken (Mon.23), saltuie (Mon.24), seteisken (Mon.25) and usekerte (Mon.26), although none of these has any precise geographical reduction except saltuie, on whose site the Roman colony Caesaraugusta (Zaragoza), and kelse, where the Roman colony Iulia Victrix Lepida (Velilla de Ebro) was founded and whose location is unknown, although identifying it with the Cabezo de Alcalá site in Azaila has been suggested. The usekerte mint is located somewhere in Lower Aragón, either in the Palo de Alcañiz or in La Puebla de Híjar. Specifically, it has been argued (Jacob 1987-1988; Burillo 2001-2002), on the basis of several landscapes passages by Livy, that the Lower Aragón zone would have been inhabited by some Ausetani, called Ausetani from the Ebro in order to differentiate them from the homonymous populus living around the city of Auso (Vic). 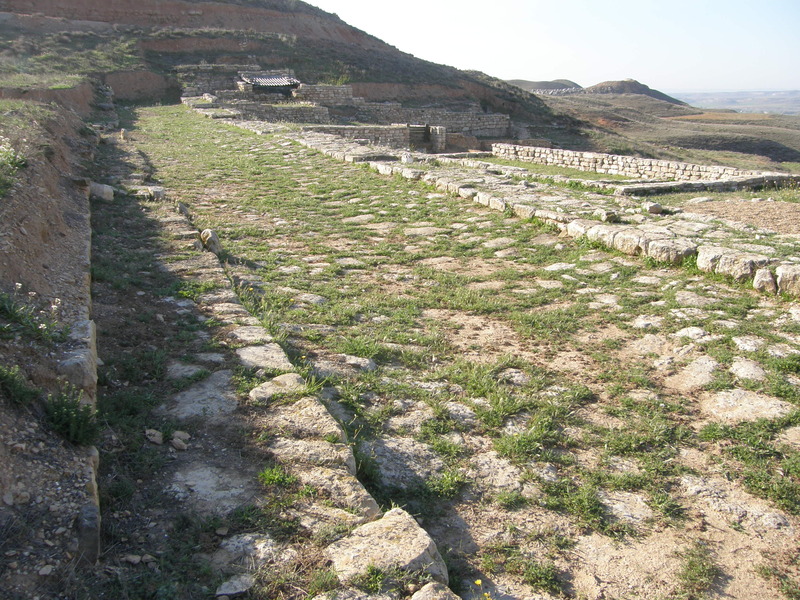 The site which has rendered most inscriptions is the Cabezo de Alcalá in Azaila (TE.02), excavated almost entirely by J. Cabré during the first half of the 20th century. This collection has more than four hundred and fifty texts, although they are all very short and in many cases must be abbreviations or simple marks, with monoliterate graffiti being very typical. They are mostly engravings on ceramic objects, principally on black glazed earthenware (Campanian), amphorae, large jars, and loom spindles and weights; the rest of the epigraphs are cut into loom weights made from alabaster. The site is known for its painted ceramics, but there are only a couple of simple tituli picti (TE.02.014 and TE.02.316a). There are, though, a small group of four texts painted on ceramics in El Castelillo de Alloza (E.04). Graffiti on ceramics in several sites within the municipal limits of Alcañiz (TE.11) and in El Palomar de Oliete (TE.05) have been discovered, among which those done on two spindles stand out (TE.05.06-07). 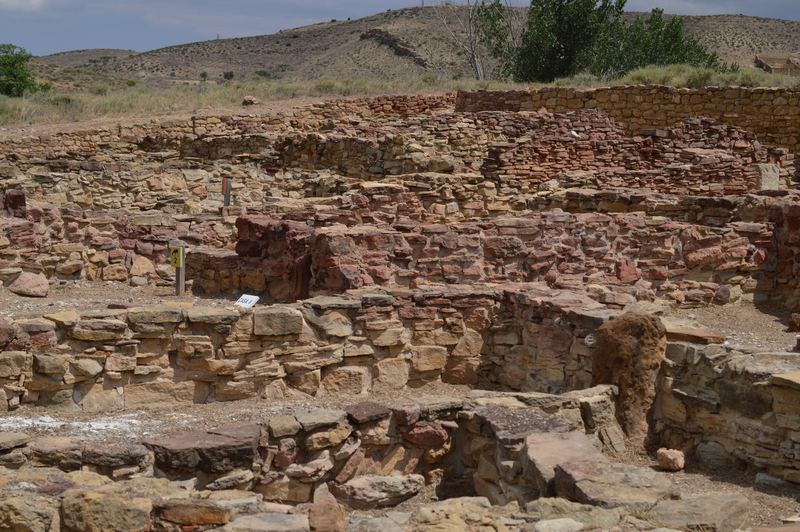 Several have also been recovered from the site of La Cabañeta in Burgo de Ebro (Z.11), a city founded ex novo and of an Italic kind, in which most inscriptions are Latin, but from which an Iberian graffito on more widespread ceramics within the whole collection also comes (Z.11.11). Also noteworthy are the potters’ ovens which have been unearthed in Mas de Moreno, Foz Calanda (TE.09), in which a collection of more than ten seals on ceramics has appeared, on several of which the Iberian anthrophonym ilturain appears, which is also attested in a seal in Azaila (TE.02.001), printed on a kind of dolium that has ended up being given the name "ilduratin large earthenware jars". There are also seals in other sites, among which the examples on locally produced mortars stand out; on those from Caminreal (TE.04.04) and Fuentes de Ebro (Z.12.01) there is a seal written in Latin and another in Iberian, which have been interpreted as bilingual texts. The Iberian steles in Lower Aragón are known for their decoration, made up of spearheads and horsemen (Cabré 1915-1920). Yet only one of them is, moreover, inscribed: that in Cretas (TE.15.01). In Caspe one fragment with a few letters and one singular piece have been recovered, the latter of which has no exact parallel since it is a stele finished off with a round protruding lion (Z.16.01-02). In the south, in the zone of Maestrazgo, three fragments from steles in La Iglesuela del Cid (TE.19) are known which are similar to those recovered in the neighbouring F epigraphic zone. Finally, the stele of Mas de Barberán (TE.18) is a unicum on account of it being anthropomorphic and having been engraved on a disc shield, as well as possessing the longest text in the stone inscriptions of this region. Equally exceptional are some inscriptions such as the engraving on a bone stamp in Alto Chacón (TE.16.03), the incision on an adobe in Calaceite (TE.14.01) and the engraving on an intaglio in La Guardia de Alcorisa, from which three marks on a loom weight are conserved (TE.08.02). See the table with the Hesperia reference list used for this zone E.
In this region no texts are known prior to the 2nd century B.C. ; only one epigraph from San Antonio de Calaceite could be dated to the end of the 3rd century B.C. (TE.14.01). The rest of the epigraphs date from late Iberian period, between the 2nd and 1st centuries B.C., when Iberian epigraphy expanded in the middle valley of the Ebro. This chronology fits in well with the fact that no dual inscription in the region is known, since this system seems to fall into disuse at the end of the 3rd century B.C. Some of the most significant collections come from sites whose destruction is linked to the Sertorian Wars: Azaila, La Cabañeta, Caminreal, El Palomar, etc. The bilingual issues of CEL/kelse (Mon.21) and OSI/usekerte (Mon.26) are dated later. The most modern texts are two short graffiti on terra sigillata in Masico de Ponz, Alcañiz (TE.11.03 and 05). Sites in epigraphic zone E with their Hesperia reference. Sensitive map: click over the sites of Celsa and El Palomar de Oliete in order to see photos of the sites.